I thought there had been a bit of inconsistency with the show openings this year - the first couple of weeks were interminable, last week was so much better thanks to Lena Philipsson, and I had hoped for The Ark to open the show but they didn't. Alluding to this week's host city as 'Sweden's version of Chicago' (maybe a Swedish reader would like to explain this to me - does Malmö have a tough reputation? ), the hosts launched into a 'Chicago' song and dance routine with lyrics about Malmö. Anyway at least the opening didn't last too long, so on with the songs! (Interestingly enough, when the week's artists were announced, it was Linda Bengtzing who got the biggest cheer). "This week's "Curse of Dilba" award - which I award every week to an established artist whose reputation means nothing at voting time - goes to Melody Club, a rather good and well established band. I liked "The Hunter" and it was a catchy and well-staged song, however it suffered from the lead vocalist's nervous vocal performance. I've always felt that this band were in the shadow of The Ark, so it didn't do them any favours when that band were this week's interval act. (More about that later). I really wanted it to qualify though. One artist who didn't have any chance of qualifying this week was the previously unknown Julia Alvgard who made it to the final 32 as one of the webbjoker winners along with week 1's Jonas Matsson). On the plus side, she sang well and her song deserved to be there as it was very nice, although maybe lacking an 'edge' which would have made it even better. On a fashion note, I liked her hair but that dress with the padded shoulders was so wrong and it made her look like an old woman. Tonight's food accompaniment was cheese and onion loaded potato skins, and I thought it would be a very good time to head off to the kitchen and pop them in the oven. Anything to avoid the offering by Lasse Stefanz. They may be one of Sweden's oldest and best loved dansbands, but aaaargh! What really shocked me was that this was written by Bard, Oson & Norell - all that songwriting talent and all they could come up with was Simply The Best? On the plus side, it had timpani and castanets. And that's about it really. Who knew that Linda Pritchard would be so great? "Alive" was a big ballad, now you know I don't like ballads but was really impressed by her performance here. The chorus could have been stronger, but she really sold the song and it deserved to qualify. The styling was terrific - I love her hair, and that dress was amazing. Of course they wheeled out the good old SVT wind machine, and in 'Moving On' style I half expected that raised platform to make an appearance too. 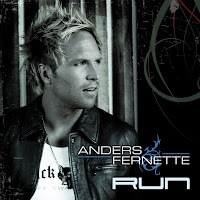 I was really looking forward to seeing Anders Fernette singing "Run". I liked that moment when the backing vocalists ran out on stage, but my previous concern from my 'just a minute' post still stands: too many unnecessary distractions, all that Cirque du Soleil stuff going on overhead wasn't needed. His vocals were off in places, but at least he tried hard and I'd probably listen to this song after the contest is over. And so to the long awaited comeback of Linda Bengtzing to Melodifestivalen. She seems to have taken over from Nanne and Carola as the fans' schlager-drottning of choice - why, she even looks like Carola now. On the plus side, I liked the song better tonight and she always looks as if she's really enjoying performing on the MF stage, and she packed this schlager-by-numbers with lots of sparkle and oomph. On the minus side, there is a fine line between competing in MF and being consumed with desperation to win it. On Saturday night I thought Linda maybe crossed that line or got very close to it. Oh and by the way I don't like yellow, and I hated those boots IMHO. It took a while but I've finally warmed to the two hapless interrogators and I thought it was quite a funny moment when they mixed Nicke Borg up with Nick Borgen. (Funniest moment on Saturday for me was when they were talking to Love Generation who mentioned RedOne and the guy sang "Red Red One" which really made me chuckle, although no-one else here found it remotely amusing). Anyway, Nicke Borg....bad styling, with trousers which looked far too big, and then that jacket-removal moment to reveal lots of tattoos. The song itself was an effective an anthemic hands-in-the-air swaying rock ballad, a real vote-winner. During the song I declared 'major dark horse alert'. Then they did the hologram guitarists thing and when that 'Anna Bergendahl' moment happened, with the audience waving lights around, I then declared: 'this is a finalist here'. I thought Love Generation were pretty good, and delivered a slick and professional routine with their vocals working well for most of the time - which you can't always say for many girl bands. "Dance Alone" was like a cross between "It's Raining Men" and a 90s dance song, and I liked it a lot more than I'd expected to. I missed the dull 'Hurricane' segment but was back in time to see The Ark take the stage after a "drill instructor" entrance with the band (surrounded by 'soldiers') dressed in military costume which was later stripped off to reveal some fab white outfits. A brilliant performance of "Breaking Up With God", and a very emotional one too as it would be their last major television appearance before splitting up. Results: Linda Bengtzing won, with Nicke Borg getting the other Globen ticket after the second voting round. Love Generation could only make it to Andra Chansen, which was a major surprise, although Linda Pritchard was less surprising as she really was a revelation this week. As you can see though, from the attached running order for the Andra Chansen duels, it's going to be tough next week. I don't like the duel format, it's pretty unfair and could result in the 'wrong' songs being chosen due to the luck of the draw. Do you know what? I'm not even going to try and predict next week's result!! So I guess it's a final 'smyglyssna' then...after that we'll have heard all this year's MF songs. So here's my first-listen thoughts for this week. "The Hunter" - Melody Club. Not quite as flamboyant as The Ark - but then who is?? Anyway it's not too bad, quite a catchy song with the band surrounded by giant chess pieces and the guitarist playing his solo on top of an illuminated piano. I think I'll like this one on Saturday, but it could be this week's recipient of the "Curse of Dilba". "Better or Worse" - Julia Alvgard. Another one of those webbjokers, which I can see being scrapped if this song doesn't progress beyond its heat. Powered by a cool electro-Robyn-style beat, I rather liked this but in a week of 'names' she could suffer from being an unknown. Maybe it would do better if it had been sung by a more famous name. "En Blick och Någonting Händer" - Lasse Stefanz. This is basically Tina Turner's "Simply The Best", rehashed dansband-style, and on this performance I felt they couldn't care less. Which is sad really, particularly given the song's stellar songwriting pedigree. I expected better - at least The Playtones have a bit of life about them. But LS are pop-u-lar, so anything could happen. "Alive" - Linda Pritchard. Her song last year didn't really show off her vocal abilities but she is a really powerful singer and vocally reminded me a little of Jennifer Rush (oops, really showing my age now!). This is a big ballad and there's always room for them at MF/ESC so this is going to sneak a qualifying place, but I'm not sure whether it's to the final or to Andra Chansen. "Run" - Anders Fernette. One of the acts I was looking forward to seeing the most this week. It's an 80s-style pop song crossed with something from the Enrique "Escape" era. Fine so far but I thought everything going on around it was far too distracting: I could have done without all that acrobatic swinging on silks and backing singers throwing giant strips of toilet roll around :) Prediction: top 5 but missing out on that all important place at AC. "E Det Fel på Mej" - Linda Bengtzing. Dare I say that she's just won back her title of 'ultimate schlager gueen' from Jenny Silver?. Firstly it's very good to have her back, and I say that as someone who wasn't a fan till "Hur Svart..." converted me. There's a mid-chorus key change and an energetic performance, but I'm sorry to say that I expected much better. The problem with this is that it sounds like about 300 former MF entries thrown into a blender to produce schlager-by-numbers. But it's a qualifier! "Leaving Home" - Nicke Borg. Wow that man's got a lot of tattoo art going on! A great big old anthemic rock ballad here - it really feels like 80s night. But there's nothing wrong with that. Rock may be a dirty word over here but it's still very popular in many European countries including Sweden, therefore don't be surprised if this is a surprise qualifier. "Dance Alone" - Love Generation. Do you think they'll sing "Red One" at the start of it? Still on this little 80s theme here, all together now..."I dance alone, hallelujah it's raining men..." This could do pretty well I think, and is an absolute qualifier to Globen. (Should it go that step further, a lot will depend on their live vocal ability as the history of the Eurovision Song Contest is littered with girl-group disasters...anyway that's just speculation for now). Lots of strutting and pointing and posing too, so that should keep the schlager contingent happy for a while. To Andra Chansen: Nicke Borg and Linda Bengtzing. For a long, long time - well, certainly over the last few summers anyway - there has been much debate and speculation, mainly in the Swedish tabloid press and of course here in blog-land, that the annual Swedish summer TV ritual, SVT1's Allsång på Skansen, is past its sell-by date. Or at least, in need of a new presenter anyway. Well, finally, the time for change has come. At a press conference today it was announced that the new presenter of Allsång would be none other than Måns Zelmerlöw, taking over from Anders Lundin. Last summer it was suggested in the Swedish press that MZW would be the perfect choice to step into Anders' shoes. In a previous post on this blog http://europecrazy.blogspot.com/2010/07/mystery-of-allsang-lotta-and-missing.html I also agreed with that suggestion; I thought it would bring a freshness to the show, whilst keeping the traditional aspects alive. Måns may still be a young man, but in recent years he's gone from Idol contestant to all-round entertainer, and he has proved himself as a multi-talented singer, dancer, musical theatre performer and TV presenter, with a very likeable personality. In other words, the perfect choice to succeed Anders who has presented the show for the last 7 years. which includes some particularly crowd-pleasing video footage of Salem Al Fakir and Oskar Linnros. Enjoy! The new era begins on 28th June - make a note in your diaries! Goodbye Anders, hello Måns: picture courtesy of Aftonbladet. Week 3 of my favourite annual musical event, but it was spoiled a little by the 'foregone conclusion' aspect. A little bit of background first. 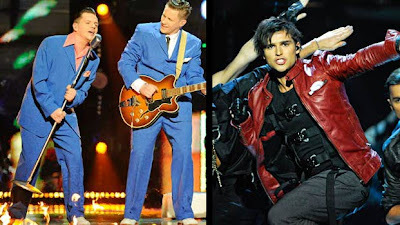 This year's Melodifestivalen hasn't exactly been welcomed warmly by the Swedish tabloids, particularly the "Hurricane" interval act, and various accusations of plagiarism etc. But life goes on, and we arrive at the third instalment of 2011's continuing saga. Another week, another town...this time it was Linköping's turn to host the festivities. However, due to a little internet blip I missed Lena Philipsson's opening number "Idiot" but I was impressed enough with the chord progressions and then found out that Oskar Linnros was involved in it, which equals significant levels of wonderfulness. Which, sadly, couldn't be repeated tonight. There was that interminable car-chase intro. There was Marie's slicked-back hairdo - she's such a pretty girl, so why are they trying to hide it? I liked her purple and silver dress though, so that was ok. When all this week's finalists were announced, Eric Saade got the biggest cheer of all. Hmm. 1. "Lucky You" - Linda Sundblad. A woman of many talents, and it was very nice to finally see her at MF, but there was never any chance of this being a qualifier. However, it did sound like a radio hit and it'll be interesting to see how this one goes after the contest. 2. "Tid Att Andas" - Simon Forsberg. A newcomer to MF, which inevitably means that he has to establish himself. 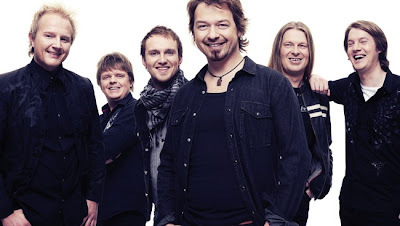 The song was written by Fredrik Kempe: does he ever have any other facial expressions apart from smug??? That apart, young Simon was a good enough vocalist, although lacking in charisma. The song was a little too old-fashioned, but it did have a big triumphant silver ticker-tape finish. 3. "Enemy" - Sara Lumholdt. Marie Serneholt's former A*Teens bandmate finally made her MF debut as a Cheryl Cole lookalike singing a "Battlefield" soundalike. Pole-dancing made its MF debut in the 'postcard' - well I guess it had to happen :) Anyway the song was modern but annoying, with Sara styled like Cheryl Cole, surrounded by cinema door attendants and a wind machine. 4. "The King" - The Playtones. The one thing you can always rely on at MF is diversity, so here we had the kind of act not seen since the days of the Stray Cats, but they do have that Dansbandskampen win in the bag, which counted for a lot. Great balls of fire....will someone please fetch a fire extinguisher! 5. "I Thought It Was Forever" - Shirley's Angels. With a very simple light-box background, which can be a good thing at ESC ("Shady Lady") or indeed a hideous thing ("That Sounds Good To Me") but anyway it was all drama, and strutting, and hair, and arms, and a wind machine thrown in for good measure. Maybe I'm getting soft in my old age, but I liked this. By the way, don't Shirley's fellow angels Jessica and Vera look like twins? 6. "No One Else Could" - Sebastian. A welcome return for Mr Karlsson. And a gang of Hanna Lundblads. Very Killers. Me like. And he blew a kiss at the end which completely sent me off my trolley. 7. "Spring för Livet" - Sara Varga. A brittle, sensitive performance of a song which is apparently about domestic violence, and which the organisers described as the most 'political' song in the contest since Christer Sjogren's "I Love Europe" (????) Anyway some call it boring, but I thought it was quite mesmerising. 8. "Popular" - Eric Saade. 'Plagiat!' yelled the tabloids. Not that we'd suggest any influence by Boney M's 'Rasputin' or Lili & Sussie's "Oh Mama" of course. This is clearly screaming '2011 Swedish Eurovision Entry' but dare I say that it would not be such a good idea if that was to be the case? If it's between Eric and Danny then at this point I'd have to go with Danny, all the way with a contemporary clubby-dance number. This week it was Lena Philipsson's turn to be transformed by "The Hurricane" into a heavy rock star, which resulted in = "Dance In The Neonlight" - Lena Philipsson with Dead By April: it's certainly not a patch on the original, but she showed up most of the evening's participants with her incredible professionalism. Another country where Gaga finds herself looking up from the no.2 position....but it's a very unusual no.1. "Over The Rainbow" by Israel Kamakawiwo'ole seems to be having a resurgence in some of the European charts at the moment. 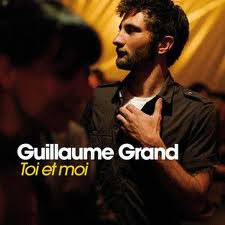 I'm not sure why it's no.1 in France as I've been out of the loop with the French music/TV scene for a while, but it's still a very sweet and touching version of the song, which IMHO is preferable to the Eva Cassidy version which dominated every TV talent show audition back in the day. But I digress. Inevitably it's the same old story, international r'n'b conveyor belt hits all the way. Nice to see Shakira's "Loca" doing so well over in France. I can't understand why it flopped over here, particularly with Dizzee Rascal on guest rapping duties. Things have been a little stagnant over the last few weeks in the Swedish singles charts - but I have no complaints about the incredible run at no.1 by September's "Mikrofonkåt" which was finally ended by (inevitably) "Born This Way". Which in turn was knocked off the top this week by Bruno Mars' "Grenade". Yes, not even the Sverige Topplistan is immune to the over-played, over-rated and tedious international hits. But reassuringly it won't be long till Melodifestivalen-madness takes over the singles chart. Strangely enough though, only Le Kid (no.31) and Dilba (no.20) have cracked the singles chart as yet. Maybe once all the songs are available, after all the semi-finals have been completed, then we'll get a better idea. By the time I publish the next Swedish Charts Update, it'll be Melodifestivalen mania - so let the madness begin :))) ...or maybe not? Apologies once again for the lack of posts on this blog so I'm going to try and make up for it with a little blog-bonanza this weekend (time permitting). The only other MGP song in the top 20 this week is the BlackSheeps "Dance Tonight" - I'm still quite surprised by the popularity of this song. http://www.youtube.com/watch?v=lT0PLRMEP6g and I won't even talk about their grammatically incorrect spelling as there seems to have been a long-running debate about this over at YouTube. 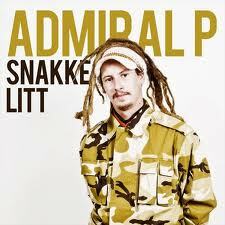 Meanwhile Admiral P brings a little reggae-flavour to his urban-pop "Snakke Litt": http://www.youtube.com/watch?v=quE6rBVTHkQ - it's a very catchy song isn't it! Of course the majority of the singles chart is dominated by some familiar names - Enrique Iglesias, Rihanna, Adele, Taio Cruz, Usher, Bruno Mars. It's a little bit sad that more and more, the European charts appear to be losing their identity, with local acts being in the minority. For example, only 7 of the top 20 chart singles are by Norwegian acts. But, at least for one week, Norwegian music is reigning supreme with Stella more popular than Gaga. Well done! "Lucky You" - Linda Sundblad. 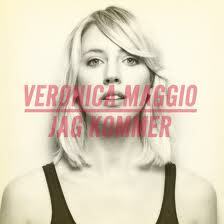 She looked a little like Veronica Maggio in the clip, don't you think? It's a tough week and I don't think this has any chance of qualifying, but I rather liked it. The song could be a real grower and I'd play it after the competition was over. "Tid Att Andas" - Simon Forsberg. This week's big-Swedish-ballad. For me it was reminiscent of "Se på Mej" meets "Hollow". But yet again I don't think it'll make it out to either Globen or AC, unless he delivers a spectacular showstopping performance. "Enemy" - Sara Lumholdt. One from the Avril Lavigne-by-numbers rock ballad conveyor belt, with a lot of elaborate dancing going on around it. She's got a good enough voice but this doesn't do it for me, sorry. "The King" - The Playtones. There's still a lot of love for these Dansbandskampen winners in Sweden, so this will probably sneak a top 5 place but no more. "I Thought It Was Forever" - Shirley's Angels. Wind machines, lots of big hair whooshing and big choreography. And Shirley Clamp at the helm. Yes it's a dramatic big gay old stomper, a kind of "Min Kärlek" slowed down for a new decade, and a definite top 5 I think. "No One Else Could" - Sebastian. Don't expect me to be remotely rational or fair when it comes to the idea of Mr Karlsson returning to ESC. I love, love, love him! The song is a modern electro-pop-rock number and I hope it does well. After all, he was in "Idol" and that seems to mean more and more at MF - so let's hope it's the same this week. And he's even borrowed one of Salem Al Fakir's woolly hats (!) Aww!! "Spring för Livet" - Sara Varga. Is this the same Sara Varga who was spinning discs behind REbound on Sommarkrysset last year? Because this is a million miles away from that. It's very unusual and different from anything else so far - so I'll stick my neck out and say it could go all Caroline af Ugglas. Or it could completely bomb. "Popular" - Eric Saade. And now for the main course. He doesn't even need to turn up because he's so "popular" now that Globen is guaranteed. There's some slick dance routines and I see what they mean when they compare this riff to Lili & Sussie's "Oh Mama". Have we seen the winner? I don't know, will have to hear it in full. But on first hearing, well, I don't like it as much as I wanted to - "It's Gonna Rain" is so much better and they should have tried that at MF instead. But it will grow on me, no doubt. Once upon a time I hated "Manboy" but that eventually wore me down! 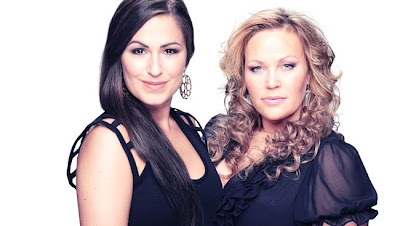 To Andra Chansen: Sara Varga and Shirley's Angels. After the credits rolled on Heat 2 of Melodifestivalen, it was straight over to NRK's website to catch the end of the voting. Believe it or not, I still haven't watched the whole MGP final yet, but my immediate question was - how come Babel Fish didn't make it to the superfinal, yet the Lucky Bullets and Sie Gubba did? Anyway it was all a foregone conclusion, and there was no doubt that Stella Mwangi's infectious performance of the insanely catchy "Haba Haba" was taking her all the way to Dusseldorf. There are still lots of songs to be selected, but I think this is in with a really strong chance. I'm not even going to waste words or energy on the Belgian selection this year, suffice to say that the success of Tom Dice will definitely not be repeated by Witloof Bay and their acapella nonsense "With Love Baby". Talking of Tom Dice, this year's Finnish entry "Da Da Dam" by Paradise Oskar (pictured above) is definitely in that same style and is quite nice, although my favourite entry in the Finnish final was "Good Enough" by Father McKenzie, who are a very promising Swedish-Finnish band who recently supported Salem Al Fakir at his gig in Helsinki. Finally, off to Iceland to catch the last half of their national final. Despite being a big pre-contest favourite, it wasn't to be second time lucky for Yohanna - even with a better dress than last time :) Being completely shallow, I couldn't remember much about Magni Asgeirsson's song, but I did find him rather attractive.. :) Anyway he came second, to a song which had its own emotional back-story. The song "Aftur Heim" was meant to be sung by its composer Sigurjon Brink, however following his recent untimely death, a group of his friends stepped in to perform the song in his memory. I'd never heard the song before and had expected an emotional ballad, so it was an unusual surprise to hear an uptempo, almost trad-jazz number. Inevitably, Sigurjon's Friends won the competition, and will represent Iceland this year. By the end of the contest there was not a dry eye in the studio (and I'll admit I was getting a little misty-eyed here too). Being realistic though, I don't see the song qualifying out of the semi-final. Above: the late Sigurjon Brink. Off to my favourite west coast city for week 2 of this year's MF tour. Which began, for no reason whatsoever, by a "Barbie Girl" routine...then Marie having a laugh at her own expense after last week's results mishap. Rickard was dressed in what looked like a velvet jacket, and Marie wore a dark grey glittery dress, however I didn't like her hair this week...but anyway on with the show. OK not yet, as this week's special guest Christer Sjögren, um, 'treated' us to a rendition of that good old favourite German ESC entry "Dschinghis Khan" from 1979. Now...can we get on with the show please??? But before we start, can I just say that I'm getting used to Bad Cop/Bad Cop who have been appointed by no less than Carl 'Bad Jacket' Bildt to interview this year's MF entrants for the 'postcard' segment, and it's quite good fun. First to take to the Gothenburg stage on Saturday night was Brolle, making his first (and long overdue) debut appearance at MF. By this point I was literally shaking with excitement at the thought of finally seeing this big event. It was certainly a gutsy and passionate performance by an artist who has totally perfected his stage-craft thanks to his work in musical theatre over recent years. Unfortunately "7 Days and 7 Nights" fell short of the greatness of "Playing With Fire" but then that's a pretty big ask anyway. But it was enough. Once upon a time, the main objective of appearing in Melodifestivalen was to win it and go on to represent Sweden at the Eurovision Song Contest. In my view, that no longer applies. A Melodifestivalen appearance is the most effective marketing opportunity that any artist in Sweden can get. So, it's a good way to promote an established artist's new album, or revive a dormant/fading career, or launch a new artist. Loreen is one of the latter, and she certainly made an impressive debut with a high-intensity performance of "My Heart Is Refusing Me" a modern, uptempo dance number which already has become one of this season's fan favourites. Great, powerful vocals and a strong image - I think we'll hear a lot more from her. There is one certainty in MF: every few years you'll get a drag queen turning up. And sure as night follows day, 2011 has brought the latest one...Babsan. Whose "Ge Mig En Spanjor" nicely coincided with me heading off to the kitchen to pop some potato wedges in the oven. Which probably said it all, really. 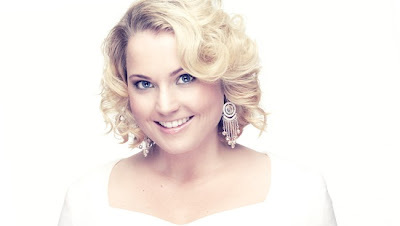 Elisabeth Andreassen is, of course Eurovision royalty on both sides of the Sweden/Norway border. But in these modern times, it felt as if "Vaken i en Dröm" came from another era. It did have those reliable MF-staples: the wind machine and the backing singers brought out for the grand finale though! However, IMHO the song was a bit forgettable. And on we go to the evening's favourite - Sanna Nielsen, making her Melodifestivalen comeback. That's funny: I remember after "Empty Room" failed to win, she said she'd never compete at MF again.... anyway she was back with "I'm In Love" - a more uptempo number, staged with her walking around in a 'schlager-cage'(!). She's a strong vocalist and a pretty girl, yet I thought all the styling was wrong. Her hairdo was in September-style, but she was dressed like a middle-aged woman at a wedding. I hope she ditches that jacket/bolero thing for the final. 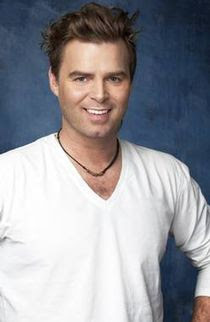 I'd looked forward to seeing Daniel Karlsson again, as he was a big favourite of mine during Idol. I mentioned the Idol-recognition-factor last week, and Daniel was yet another to benefit during this year's voting. "Oh My God!" was catchy, yes, but for some inexplicable reason it annoys the hell out of me. Ooh la la, ooh la la. More moving treadmills here, and our Dan dressed like a Buddhist monk for some reason. The potato wedges were ready by the time newcomer Anniela took to the stage with "Elektrisk", wearing what looked like a satin hedge on her shoulders, and it screamed 'non-qualifier', zapped from the competition by those two onstage pylons. Yet it wasn't all that bad and I hope we see her again in the future. Finally, to the other artist I was really looking forward to seeing. Christian Walz has been a particular favourite artist of mine in recent years. "Like Suicide" was effectively staged with six sitting violinists and an imaginary orchestra backdrop.Christian, for some strange reason, sported a rather unflattering beard and for reasons known only to himself, a string of pearls around his neck. I like the song though, it's a little reminiscent of a midtempo Darin ballad mixed with Christian's distinctive style. Sadly though, despite that great draw position, the song's title was to prove prophetic and this was to be his first and last appearance at this year's MF. I've very quickly decided that this year's interval act is probably one of the worst of recent years. I really don't see the point of Peter Stormare's character The Hurricane....and his reinvention of Christer Sjogren into Cosmos Lakebranch, a dansband Ziggy Stardust, singing "Life On Mars" had me going into cringe overload. Voting time! Sanna and Brolle to Globen, Loreen and The Moniker to Andra Chansen, Christian 5th, Anniela 6th, Babsan 7th and Elisabeth 8th. As I said previously, Melodifestivalen doesn't care about reputations, as Christian and Elisabeth found out to their cost this week. One turkey was bad enough: now we've got two. Friday 11th February 2011. So began a weekend packed with Eurovision action. Due to a change in my social arrangements I was able to follow the Irish national final on Friday night, although after about 5 minutes of it I realised that it was probably not such a good move. If the Dutch final a couple of weeks ago seemed low-budget, then that was nothing compared to this one: buried within the Late Late Show on a Friday night, not exactly peak-time Saturday night viewing was it???? Once upon a time, in the mid-90s to be precise, my three-quarters ancestral homeland, the Republic of Ireland, was once the home of Eurovision. 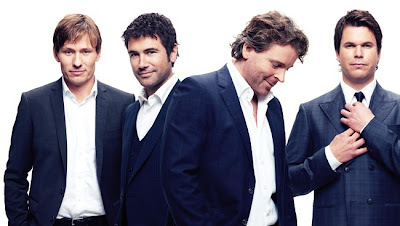 In recent years however, Ireland has not exactly covered itself in glory at the Eurovision Song Contest, with only Brian Kennedy achieving a top 10 position since 2003. Ironically, Mr Kennedy was one of the panel offering their comments on this year's crop of entries - and despite his pledge to be brutally honest, he fell into the trap of his fellow panellists (including Cheryl Baker) by offering praise where it really wasn't necessary....! Imagine The Script fast-forwarded about 20 years and voila, you have "Talking With Jennifer". In retrospect it wasn't that bad actually, but on the night it just felt, well, old-fashioned and irrelevant. Yes, those two from X Factor 2009, the irritating identical twins with, um, rather distinctive quiff-hairdos. Never have two people with so little talent gone such a long way and maximised their 15 minutes of fame, stretching it out to at least half an hour. Lyrics about "car crash" and "hit and run" sums it up really. Oh dear oh dear. This took me back to possibly every UK Song for Europe competition between the 70s and 90s, such was its dated-ness. An embarrassing evening just got a million times worse. And it just got worse, with this year's contender for the 2011 "You Raise Me Up" inspirational award. I felt as if I'd been transported back to 1995, and not in a good way. Finally, to a song by the Gladnikoff/Schilling contingent who have been responsible for a number of national final entries over recent years with varying degrees of success. Whilst "Falling" was arguably the most contemporary song on show in the Irish final, and Ms Kavanagh a strong vocalist, the whole thing came over like a Poundland version of "Drip Drop" and in addition, it possibly boasted the worst use of two backing dancers since any Melodifestivalen in the 1990s. So then we had interminable debates, ad breaks, an interview with two former ESC presenters from the glory days - Cynthia Ní Mhurchú and Mary Kennedy - and an appearance by three-quarters of the original Bucks Fizz singing "Making Your Mind Up" which won Eurovision 30 years ago in Dublin. Suddenly jag känner mig väldigt gammal...anyway on to the voting which was split between the juries and the televote. It was very close for a while and the juries narrowly favoured Nikki, however despite it being long past their target audience's bedtime, Jedward triumphed in the televote which, when added to the jury scores, guaranteed them an absolute win in the competition, with their "Womanizer"-influenced song which, in the tradition of recent years' Irish entries, is co-written by Scandinavians. On the plus side they do have a strong image, but....that's all really. Three years ago, Ireland sent Dustin The Turkey to Eurovision: now, in these hard times, with inflation soaring, they (appropriately) send two. Two days late, but who needs an excuse to prolong the party??? As promised....enjoy! What...no "Cooler Than Me"? Disgraceful :)))) Enjoy the rest of your weekend!! Something off-topic to begin with, but which explains the reason why my review is a day late: It was faithful travelling companion's birthday yesterday, and we went out to our favourite local Indian restaurant to celebrate. After overloading with all that lovely food, I felt very sleepy, and not in any position to judge the short clips of this week's songs when I initially listened to them last night. Brolle: "7 Days and 7 Nights" - lots of drama here with Brolle throwing himself into the song heart and soul, channelling his inner-Elvis as he goes, and looking wonderful as always. The song itself is uptempo and dramatic although it's no "Playing With Fire", but then again what is? I think the strength of his performance alone will easily send him straight to Globen. Loreen: "My Heart Is Refusing Me" - could be the real big surprise of the week. She's a strong singer who gives a pretty intense performance here, and could sneak at least an AC place. The only problem here may be the reputation-in-reverse scenario: she's a relative unknown and that may go against her. But I think this will become a big fan favourite regardless. Elisabeth Andreassen: "Vaken i en Dröm" - it's a Bettan ballad-by-numbers here, but so was "I Evighet" for me, but it did well so we may agree to disagree...anyway it's a bit too old-fashioned, and her established reputation may not be enough to lift her off the bottom half of the scoreboard. Sanna Nielsen: "I'm In Love" - for some reason I've always found her to be lacking in warmth as a performer and therefore find it difficult to make the connection with her as an artist. This is more uptempo in the style of "Vågar du, vågar jag" and ticks all the schlager boxes but there's still something missing. Nevertheless her MF pedigree should ensure automatic qualification to Globen. The Moniker: "Oh My God" - will this succeed where the other (far superior) "Oh My God!" failed? Possible top 5 placing anyway. I liked him in Idol, and I love "Would You Believe" . This is nowhere near as good but it's quite anthemic, reminds me a little of Rongedal in places. It falls short of my expectations, but maybe I need to hear it all the way through. Anniela: "Elektrisk" - catchy electro-pop-schlager with a whiff of "Womanizer" - and we know how successful that can be(! ), originally thought it could be a possible AC contender but I think Loreen's sewn up the electro-dance market this week. Christian Walz: "Like Suicide": He's been one of my favourite Swedish artists of recent years so I probably looked forward to seeing him more than anyone else this week. What I've heard of this song suggests it's truly a touch of class, and it's been compared to "Keep On Walking" on some blogs which is praise indeed. Will it have the same impact? Good songwriters, and the feel of the song also reminds me of something Darin might sing. Good staging too. But that beard is so wrong, Christian! To Andra Chansen: Two from the following three: Christian/Loreen/The Moniker. For some strange and inexplicable reason, I found Norway's Melodi Grand Prix to be a bit of a disappointment this time round. 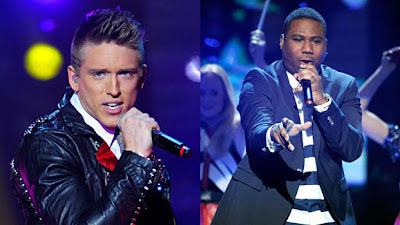 It says a lot when the best thing about the whole contest was the Heat 2 interval act when Alexander Stenerud teamed up with fellow former contestant to deliver a medley of his MGP classics...and made us all realise that's what the contest was missing this year. So after the usual three heats and second chance contest here is the final line-up. 2. "Not That Easy" - Åste & Rikke: Unfortunately this has very little in the way of redeeming features for me either, and I'm at a loss to understand how this made it to a final. 3. "You're Like A Melody" - Hanne Sørvaag: Despite her obvious songwriting pedigree, this fell short of my expectations. It's pleasant enough, don't get me wrong, sounds like a Corrs album track or something (!) but she seemed a little nervous when performing it and she'll need to conquer the nerves on Saturday if she's to have any chance of winning. 4. "Depend On Me" - Babel Fish. On the down side it's maybe a little too slushy and sentimental. On the plus side, it was the only song which stuck in my memory and I think Europe's voters could really fall for it thanks to its simplicity, melody and anthemic feel. I thought of a couple of things when I heard this: 1)Crowded House, and 2) Norway's 2003 entry "I'm Not Afraid To Move On", which is one of the loveliest ESC entries ever. Despite it appearing to be a done deal, with "Haba Haba" clear favourite to win, I wouldn't write the Fish off just yet. 5. "Dance Tonight" - The BlackSheeps. Despite the title it's a multilingual effort by an act which apparently was in MGP Junior, (which I don't follow). It's OK, got that Pink/Katy Perry vibe and the lead singer's got a good voice, but the chorus gets a bit annoying after a while and I can't see it getting a good result on Saturday. 6. 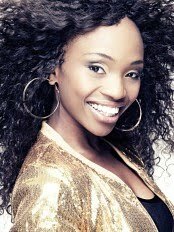 "Haba Haba" - Stella Mwangi. "Waka Waka eh eh..." oops sorry it's actually Haba Haba, which is a lively and catchy crowd-pleaser, while Stella herself is a charismatic and fun performer. The downside to this was her very flat vocals on the verses, which let the song down - but that chorus is soooo catchy and I can understand why it's the favourite. It would be a very interesting and groundbreaking choice for Norway if it was to win MGP! 7. "Alt Du Vil Ha" - Sie Gubba. I guess this is some kind of Norwegian folk-rock-dansband variant, but I'm not a fan. It's a little too bland and old-fashioned. 8. "Fire Below" - The Lucky Bullets. OK, checking the calendar to see it's not 1956. 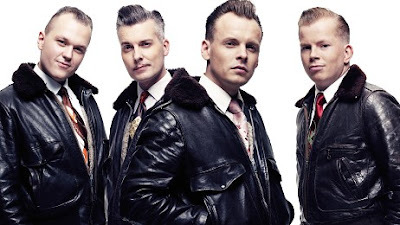 The Baseballs have much to answer for, not least this bunch of rockabilly revivalists. It has a killer draw, but if the Norwegian voters choose this to represent them at ESC then.....God, I'm speechless. 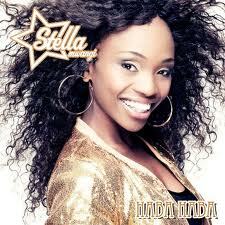 So....Stella or Babel Fish are my tips to win. Anything else will (IMHO) be a major let-down. And anyway, none of them are anywhere near as good as THIS! Or: The Idol Factor, modernity, and the opening shots in the battle for Melodifestivalen's soul....! Yes it's that time again. Last night saw the first of this year's semi-finals, and the first destination on the MF-tour was the northern city of Luleå. Just minutes before the show, there was buffering and breakdowns in the webstream but happily once the show began, we got a faultless stream which luckily didn't break down. Much as I love it, the problem with Melodifestivalen these days is that there's too much time spent on comedy sketches, and it sometimes feels as if the actual songs themselves are secondary to the rest of the show. Just like the Eurovision Song Contest itself, the intro went on for a bit too long and it was 15 minutes before we got to hear any of this year's contenders. The show began with this year's hosts, Rickard Olsson and Marie Serneholt, being inducted into a 'secret society' of previous MF hosts including Petra Mede and Anders Lundin. Then Rickard and Marie launched into a medley of MF classics, with new lyrics. These days to be an MF host you need to turn your hand to singing, dancing and comedy in addition to presenting the show. 1. "Try Again" - Dilba. I liked this, although the staging of it was all wrong, and her outfit was horrible and did her no favours whatsoever. At one point I got the feeling that she maybe regretted this whole thing. The song itself was nice and modern and dancey and reminded me of Therese/The Attic which is no bad thing. However her vocals were far too low in the mix and were swamped by the pre-recorded backing vocals throughout, and I had serious doubts about whether she was singing live at all. Despite her established reputation, Melodifestivalen doesn't make any allowance for reputations of course. 2. "Me and My Drum" - Swingfly. A major surprise here, as rap doesn't usually go well at MF, but this happy rap number blew away those memories of Frispråkarn and his cardigan from 2010's heat 1. It was maybe a little messy with the drumming cheerleaders, but Swingfly - an American rapper based in Sweden but who doesn't speak Swedish! - sold the song well with his boom-chicky-boom! Then the icing on the cake: Christoffer Hiding singing the chorus, which has a killer hook. And being completely shallow here, he is probably even more gorgeous now than when he was in Idol a couple of years back!! I was very impressed with the energetic performance, and at that point had it down for a possible Andra Chansen contender. 3. "Something In Your Eyes" - Jenny Silver. That something in your eyes may be a bit of glitter from Ms Silver's dress :) It was "me and my microphone stand" to start with, but happily she ditched the stupid prop - what is it with this lady and stupid props?? - anyway she got into her stride with hand movements, hair-tossing and all the things which have the schlager community in raptures. (Jenny has become their new schlager drottning). She performed the song very well, with a high degree of professionalism, although I feel it's a bit too similar to many of the songs which have been chosen to represent Sweden in the past, which were influenced by a certain band from 1974...! I thought this was a cert to go to the final. 4. "On My Own" - Jonas Matsson. One of this year's webbjoker winners, so we were familiar with it already. However, the staging of the song was pretty stupid and could have done without the deckchair and the kisses and putting on the jacket. I thought it could have been staged with more simplicity. In contrast to Jenny's polished performance, I thought he came over as too inexperienced and his vocals were a bit ropey at times. Live vocals! That was the first time that I thought anyone was singing live. The song was quite catchy and likeable though, in a Jason Mraz/Jack Johnson/Joshua Radin kind of way. (What's with the letter J and acoustic pop????). But I had it as a non-qualifier. 5. "Oh My God!" - Le Kid. They promised a sugar rush and they didn't disappoint. Bright colours, dancing liquorice allsorts and confetti-spraying cupcakes - what a show! It was certainly the brightest number of the night in every way. The song was well-performed and I thought they'd done well enough for a place at Andra Chansen. 6. "Social Butterfly" - Rasmus Viberg. I don't think all the vocals on this one were live either. He looked a rather strange little character, dressed as if he was down on the farm :) The song had a slightly ethnic feel to it, and had a very good chorus too. But a non-qualifier nonetheless, although I may play it a few times when I get this year's CD. 7. "Desperados" - Pernilla Andersson. She's a very established artist now and after all the dance routines and crazy staging, it was time for a bit of simplicity. A country-flavoured song with a bit of an Amy Macdonald vibe to it, it was also the only song in the Swedish language. I couldn't really remember it to be honest, it didn't really have much of a hook. 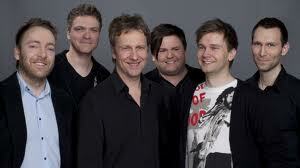 However it was quite sophisticated and I also understood its appeal and predicted a place in Andra Chansen. 8. "In The Club" - Danny. In the club, the club, oh oh. Basically that's it. However this is Danny Saucedo, who is a very polished performer - he sings well, dances well, looks good and has lots of charisma - and he can certainly sell a song. "In The Club" screams 2011 - as I said in my preview the other day, it sounds like something the Swedish House Mafia might do. The whole thing was very sharp and slick and it was no surprise that he was the night's big winner just as I predicted. All in all, a pretty good line-up of songs this week. Semi 1 is usually regarded as the "rubbish one", although of course last year's first-week was for me the best of the whole competition, for an extremely obvious reason. This week was particularly fascinating for me as it seemed to demonstrate the ongoing battle for the soul of Melodifestivalen. Where does the contest go from here? The staging and presentation of the contest has come on leaps and bounds over the years, but should the songs become as modern/contemporary as the TV programme has become? Or should there be more schlager? The fact is, Sweden has fallen out of favour at Eurovision in recent years, and Christer Björkman's answer to last year's "schlagerfiaskot" is to ditch the Swedish juries altogether in the final and replace them with international juries in order to identify which might appeal to a European audience. Maybe the problem is the link between MF and ESC: perhaps an answer would be, say, for Sweden to choose its entry in another way, maybe via an internal selection or a different TV show, and leave MF to carry on, independent of ESC. The answer, if last night's result was anything to go by, is to modernise: two songs which sound as if they just stepped out of the top 40, qualified to Globen - Danny was expected, but Swingfly was a major surprise. However look more closely and there is, yet again, a link with another massive Swedish TV show: Idol. In previous years, it was Sebastian, Måns, and Agnes. 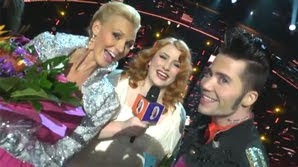 Last year's MF winner, Anna Bergendahl, was an Idol contestant, as was another finalist, Darin. 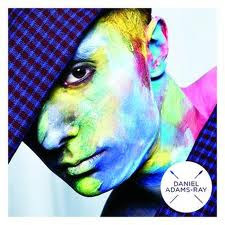 Now we have Danny, who was in Idol, and so was Christoffer, the featured vocalist on Swingfly's song. 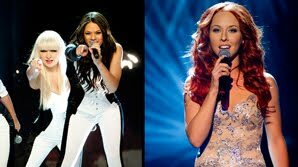 It appears that the Idol factor has had a major influence on Melodifestivalen and looks as if it will continue to do so. Which may spell good news this year for Sebastian and The Moniker (Daniel Karlsson). But then again it may not, and I could be completely wrong. Probably. What about last night's interval act? A bit disappointing actually, Peter Stormare playing record producer 'The Hurricane' reinventing Nanne Gronwall as "Nanne Soulwall" who then performed Whitney Houston's "I Have Nothing". A bit pointless really, as we'd probably have preferred her singing one of her own songs, or a medley of her previous MF entries would have been even better. Bring back Dolph! Then, of course there was the moment which got more Swedish press attention than anything else last night. Marie Serneholt reading out the wrong name, briefly raising Le Kid's hopes for a brief moment then smashing their hopes to pieces following the realisation that she had read out the wrong name. I hope this doesn't destroy her confidence as she did a good job last night (and she looked great too - loved that dress). After all she is only reading what is being shouted in her ear from the control room, so they're the ones who should take the blame. Co-host Rickard also did well, and I found him really easy to understand. SVT has a little preview-show available, "Smyglyssna med Elsa" at http://svt.se/2.148330/hem which they'll be doing every Thursday with interviews with that week's artists, and short clips of the songs. So this means the return of EuropeCrazy "Just A Minute" review of the songs (yes I've kept that little Rongedal reference! ), which of course is only based on the short clips and I'll have to hear them in full which will maybe change my mind. 1. "Try Again" - Dilba. Very un-Dilba-like if you ask me, it's as if Dilba had been abducted by aliens and replaced by a "tonight Matthew I'm going to be Kylie Minogue"-type Dilba. Very dancey, but I can't see it qualifying here. It may be one of those songs which will go on to do quite well in the charts though. 2. "Me and My Drum" - Swingfly. Again this has virtually no chance of qualification whatsoever, but well worth a mention here as the featured vocalist on the chorus is none other than Christoffer Hiding, who was a big big fave of this blog when he was in Swedish Idol so I'm really looking forward to seeing him again. 3. "Something In Your Eyes" - Jenny Silver. Wind machine? Check. Glittery Charlotte-style dress? Check. Abba-piano? Check. The kind of song and dance routine that will have the schlager-obsessives going into raptures??? Check, check, check. A place in Globen is all but guaranteed. And, thankfully, she's ditched the silver hand thingy. 4. "On My Own" - Jonas Matsson. One of those webbjoker winners so we'd heard it before, and it could go either way - either sink without trace or grab that spot in Andra Chansen. It's a nice contrast to some of the other entries and has that very appealing Jason Mraz style. 5. "Oh My God!" - Le Kid. They are colourful, almost cartoonish, and are definitely putting the fun back into pop. Probably the first one of the songs which I'd want to hear in full. Reminds me of Little Boots and something else which I can't put my finger on. They're looking good for a place in Andra Chansen. 6. "Social Butterfly" - Rasmus Viberg. I don't really get the concept, and I think it'll sink without trace, but there is something about this song which suggests it could have some post-contest life on my iPod. 7. "Desperados" - Pernilla Andersson. She's pretty popular at the moment, and this is in Swedish (I wish there were more Swedish-language songs in the contest) but sadly this does nothing for me. A bit of a country feel to it, and again a possible AC qualifier? 8. "In The Club" - Danny. It's called "In The Club" don't you know. The title gets repeated quite a lot. Danny sings and raps (!) over a backing track which sounds as if it could have wandered right out of the Swedish House Mafia's studio. A killer draw position, a contemporary dance song, and the fact that he's, well, Danny - off you go to Globen! Of course I could (and probably will) be completely wrong, but all will be revealed on Saturday night in Luleå! Scandipop - well-researched and regularly updated with lots of inside information and exclusives. I should have a bit more time this Saturday and Sunday to write a few posts about national finals etc. and of course Melodifestivalen, which is always the major highlight of my musical year. I found a brilliant post tonight over at This Must Be Pop, http://www.thismustbepop.com/2011/01/melodifestivalen-beginners-guide.html where Jessica totally articulates everything which all of us Melodifestivalen obsessives feel about the competition.